If you are unfamiliar with the functionality of PivotTables, consider exploring them as an end user. See Create a PivotTable to analyze worksheet data for a good primer on these tools. This article provides code samples for common scenarios. To further your understanding of the PivotTable API, see PivotTable and PivotTableCollection. PivotTables created with OLAP are not currently supported. There is also no support for Power Pivot. PivotTables are organized based on four hierarchy categories: row, column, data, and filter. 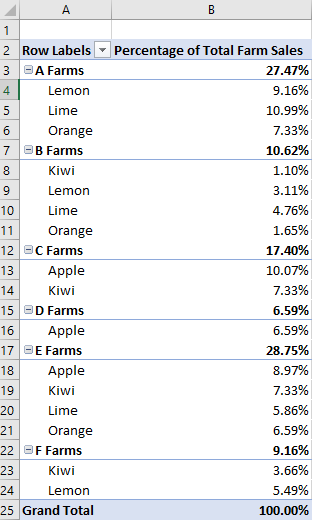 The following data describing fruit sales from various farms will be used throughout this article. This data has five hierarchies: Farms, Type, Classification, Crates Sold at Farm, and Crates Sold Wholesale. Each hierarchy can only exist in one of the four categories. If Type is added to column hierarchies and then added to row hierarchies, it only remains in the latter. Row and column hierarchies define how data will be grouped. For example, a row hierarchy of Farms will group together all the data sets from the same farm. The choice between row and column hierarchy defines the orientation of the PivotTable. Data hierarchies are the values to be aggregated based on the row and column hierarchies. 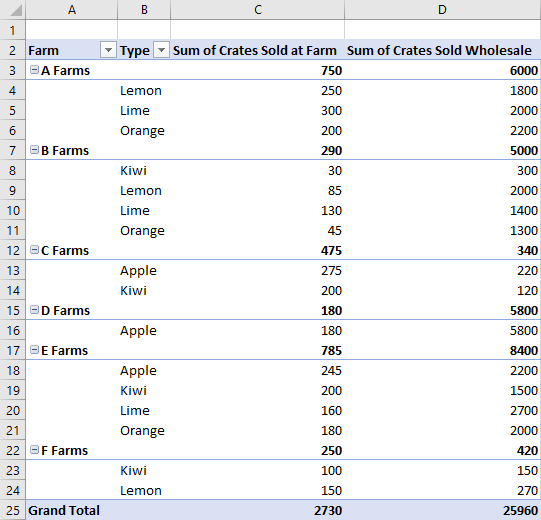 A PivotTable with a row hierarchy of Farms and a data hierarchy of Crates Sold Wholesale shows the sum total (by default) of all the different fruits for each farm. Filter hierarchies include or exclude data from the pivot based on values within that filtered type. A filter hierarchy of Classification with the type Organic selected only shows data for organic fruit. 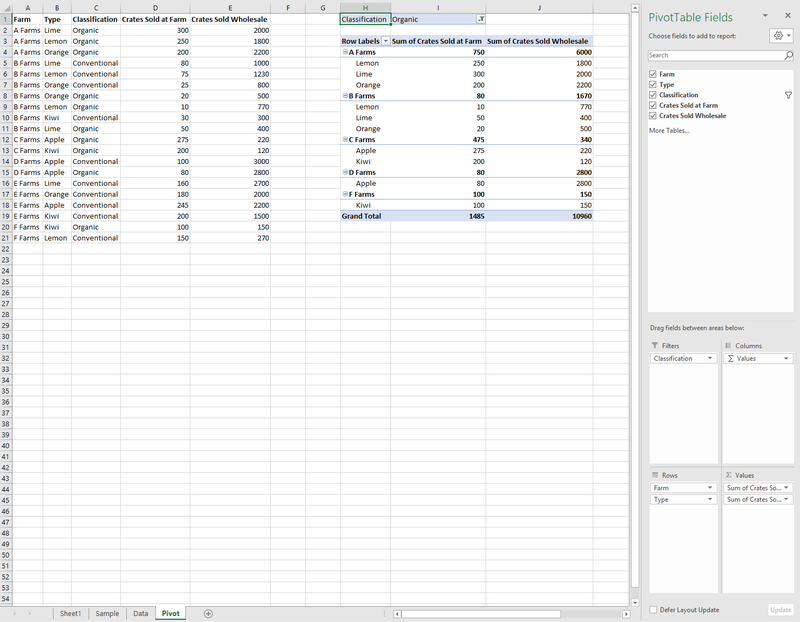 Here is the farm data again, alongside a PivotTable. 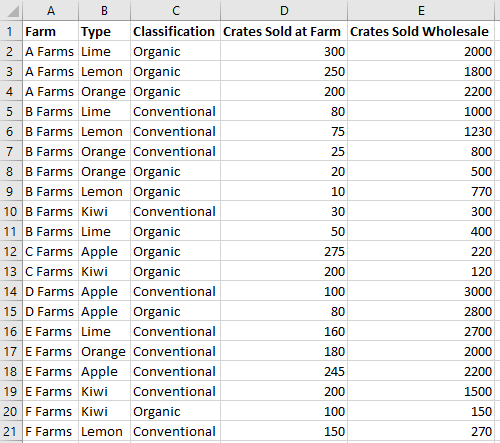 The PivotTable is using Farm and Type as the row hierarchies, Crates Sold at Farm and Crates Sold Wholesale as the data hierarchies (with the default aggregation function of sum), and Classification as a filter hierarchy (with Organic selected). PivotTables need a name, source, and destination. The source can be a range address or table name (passed as a Range, string, or Table type). The destination is a range address (given as either a Range or string). The following samples show various PivotTable creation techniques. Manually created PivotTables are also accessible through the PivotTable collection of the workbook or of individual worksheets. The following code gets the first PivotTable in the workbook. It then gives the table a name for easy future reference. Rows and columns pivot the data around those fields’ values. Adding the Farm column pivots all the sales around each farm. 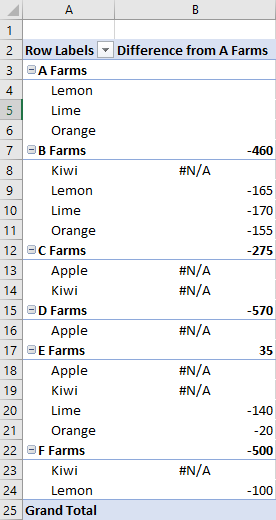 Adding the Type and Classification rows further breaks down the data based on what fruit was sold and whether it was organic or not. You can also have a PivotTable with only rows or columns. Data hierarchies fill the PivotTable with information to combine based on the rows and columns. 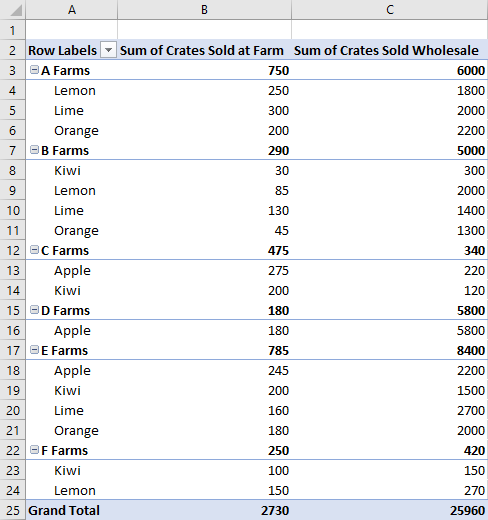 Adding the data hierarchies of Crates Sold at Farm and Crates Sold Wholesale gives sums of those figures for each row and column. 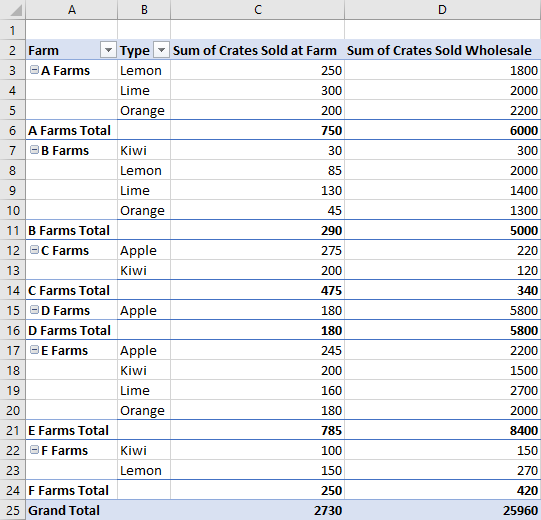 In the example, both Farm and Type are rows, with the crate sales as the data. Data hierarchies have their values aggregated. For datasets of numbers, this is a sum by default. The summarizeBy property defines this behavior based on an AggregationFunction type. The currently supported aggregation function types are Sum, Count, Average, Max, Min, Product, CountNumbers, StandardDeviation, StandardDeviationP, Variance, VarianceP, and Automatic (the default). The following code samples changes the aggregation to be averages of the data. 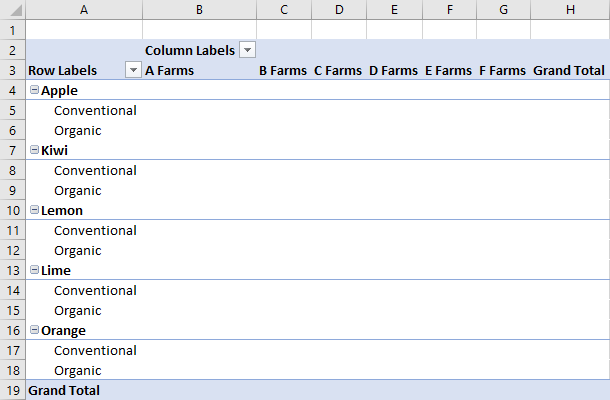 PivotTables, by default, aggregate the data of their row and column hierarchies independently. A ShowAsRule changes the data hierarchy to output values based on other items in the PivotTable. calculation: The type of relative calculation to apply to the data hierarchy (the default is none). baseField: The field within the hierarchy containing the base data before the calculation is applied. The PivotField usually has the same name as its parent hierarchy. baseItem: The individual PivotItem compared against the values of the base fields based on the calculation type. Not all calculations require this field. The following example sets the calculation on the Sum of Crates Sold at Farm data hierarchy to be a percentage of the column total. We still want the granularity to extend to the fruit type level, so we’ll use the Type row hierarchy and its underlying field. The example also has Farm as the first row hierarchy, so the farm total entries display the percentage each farm is responsible for producing as well. The previous example set the calculation to the column, relative to an individual row hierarchy. When the calculation relates to an individual item, use the baseItem property. The following example shows the differenceFrom calculation. 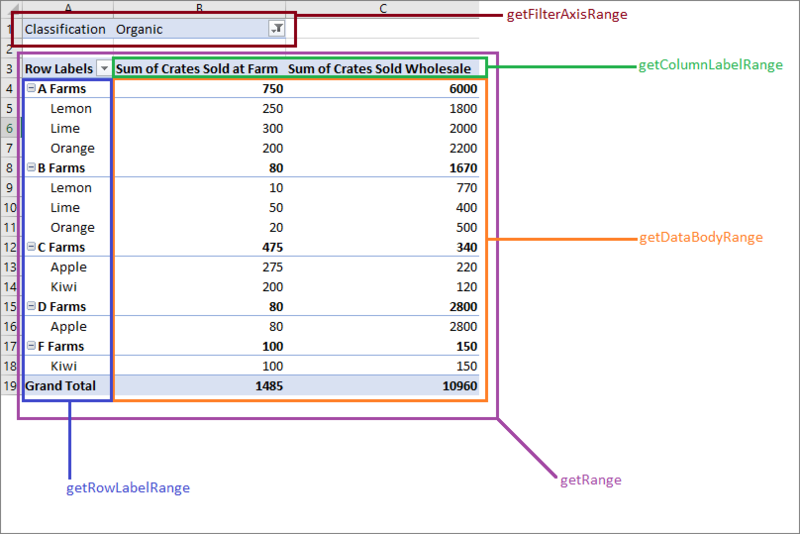 It displays the difference of the farm crate sales data hierarchy entries relative to those of “A Farms”. The baseField is Farm, so we see the differences between the other farms, as well as breakdowns for each type of like fruit (Type is also a row hierarchy in this example). A PivotLayout defines the placement of hierarchies and their data. You access the layout to determine the ranges where data is stored. The following diagram shows which layout function calls correspond to which ranges of the PivotTable. The following code demonstrates how to get the last row of the PivotTable data by going through the layout. Those values are then summed together for a grand total. PivotTables have three layout styles: Compact, Outline, and Tabular. We’ve seen the compact style in the previous examples. The following examples use the outline and tabular styles, respectively. The code sample shows how to cycle between the different layouts. Hierarchy fields are editable. The following code demonstrates how to change the displayed names of two data hierarchies. PivotTables are deleted by using their name.